Fill a large pot with water and bring to a boil. Once boiling add ears of corn and cook for 7-9 minutes. Let the corn cool completely (speed up the process by sticking in the refrigerator if needed!). Meanwhile; slice cherry tomatoes in half, dice avocado, and very finely slice your ¼ of red onion. 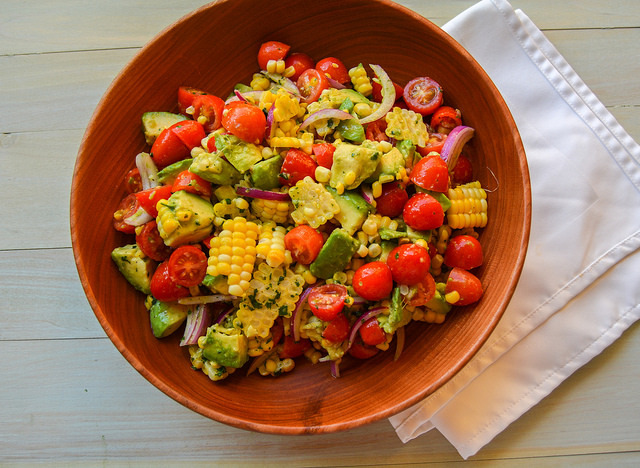 Using a sharp knife, remove corn from the ears of corn and add into large serving bowl with tomatoes, avocado and red onion. In a small bowl add the juice from the limes, olive oil, red wine vinegar, cilantro and salt and pepper to taste. Whisk until completely combined. Pour dressing over salad, toss and serve! Jersey Corn, Tomatoes, Avocado….these are a few of my favorite things (In harmony to the Sound of Music tune!). But seriously, there is not much more I love in the summer than juicy, ripe tomatoes and sweet Jersey corn. When you pair that with the ultimate ingredient, avocado (which is my favorite just about anytime), you’ve got a star studded salad. I made this easy salad on a weeknight and it fed me for lunches and sides with dinner for nearly a week! The lime dressing keeps the avocado green for a handful of days. Speaking of the dressing, the zesty cilantro with crisp lime juice makes a bright and flavorful combo that adds that over the top goodness to this dish. I need to stop writing because I’ll be whipping up another batch of this in minutes if I don’t. This will be my go-to summer salad until the final corn husk leaves those farm stands.